Hauskaa lauantaita, terveiset Eurajoelta, Korttitalkoista! Taisi osua viime vuonnakin samaan aikaan tämä emännöintivuoro: tervetuloa viikon Allsorts haasteen pariin! Valitsin aiheeksi "paljon kerroksia". 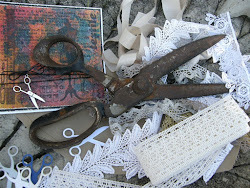 Hi; Happy Saturday, greetings from "the Craft Camp" annual cardmakers weekend meeting at the west coast of Finland. It's my time to host the new Allsorts Challenge! Theme is "Lots of Layers! In my card there is 10 layers! This was a birthday card to my friend. 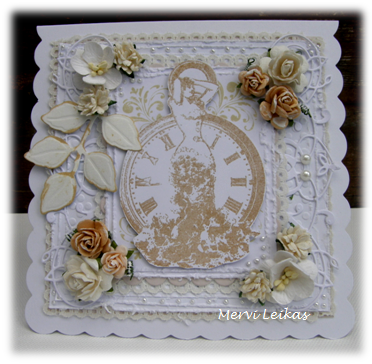 Clever card Mervi, you have used such lovely soft colours yet still achieved a great vintage feel. Hope you have a good weekend and thanks for a great theme this week. Gorgeous creation, love all the white and the flower displays. Wow, 10 layers, I don't believe I've ever used that many layers. But it's looking absolutely amazing, so detailed and beautifully vintage like. 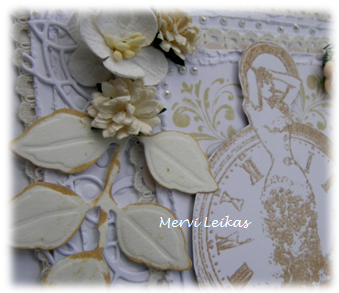 What a lovely card, your friend will love such a special creation made just for her! Thanks for joining us at Southern Girls for our flower power challenge! So lovely & elegant. Thanks for joining us for our 'Flowers' challenge #118. So pretty and elegant with a lovely vintage feel. I'm sure your friend will love this. Thanks for joining us at Southern Girls Challenge.